Breaking World Headlines - News Center: Click Here! "Sounding the Trumpet and Sharing the Gospel of Jesus Christ. 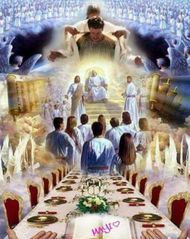 Preparing Souls for His Glorious Return"
The Gospel of Jesus Christ - Click Here! 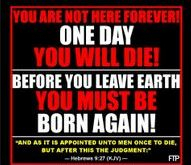 The Gospel of Our Salvation!. Sign our guestbook. Click Below! 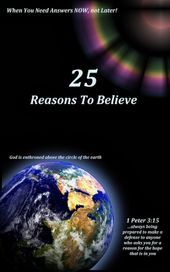 "25 Reasons To Believe" Click Below To Download. Download the Holy Bible to your computer...FREE! Right-Click image above. Choose "save link as" to download! Our website is currently receiving visitors from 190 countries and growing! Thank you all for your love and support! Visit Our Breaking News Center For Today's News. Click Here! For More Videos Click Below! This website was created and is managed with the intent, NOT to instill fear in people, but rather to inform, educate and warn Christians and non-Christians, alike, regarding the fast-approaching dark times ahead of us and also about the hope that is in Christ Jesus. Here at endtimesprophecywatch.com, we never say to "take our word for it". We encourage all people to read and study the Holy Bible for themselves. Many of today's headlines are prophetic in nature and are going unnoticed by the majority. Our Lord Jesus Christ warned us of these very dangerous and perilous times. But He also gave us the promise of Hope! 2 Timothy 1:7 tells us the following "For God hath not given us the spirit of fear; but of power, and of love, and of a sound mind." Therefore, dear visitors, understand that what we are witnessing, in real time, is the Word of God coming to pass. These are birth pangs spoken of in the book of Matthew Chapter 24 and they are getting stronger by the day! Rejoice for our redemption draws near! (Luke 21:28) God also gave us the Gospel, the best news you'll ever here. Click Here to learn about the Gospel and how to receive the FREE gift of eternal life! Many of these late breaking news go unreported by your mainstream media. No worries, however, we have you covered. We've got the TOP news sources, all in one place! This news section of our page is updated, periodically, throughout the day. Fresh news, daily! Make sure to bookmark and share our page! Click Here for our Breaking News Center. God bless you! By faith, we believe that Jesus is the Christ, the Son of the True Living God. (Matthew 16:16) This site is fully dedicated to sharing the Gospel of Jesus Christ, Worldwide, and reporting end times related news and events. We believe the Bible is the perfect, infallible Word of God and it is the FINAL AUTHORITY in matters of spirit and faith! Our goal is to share the good news, The Gospel of Jesus Christ, without sugarcoating God's word or tickling the ears of mankind with man made doctrines. 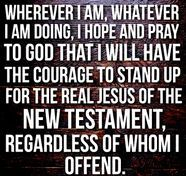 If God said it, then we MUST obey it! As the scriptures declare, "Let God be TRUE and every man a liar". (Romans 3:4) We recognize that we are sinners who have been redeemed, forgiven and our sins washed away by the blood of our most precious Lord, Son of God! We believe that we are fast approaching the return of our Lord Jesus Christ. We, therefore, encourage you to read your Bible so that our Lord will strengthen you with His Holy Spirit which will guide you in Spirit and in Truth! We ask that "The Lord bless thee, and keep thee, The Lord make his face shine upon thee, and be gracious unto thee:, The Lord lift up his countenance upon thee, and give thee peace." (Numbers 6:24-26) Thank you for stopping by and God bless you! We have partnered with CompellingTruth.org. This Christian ministry organization presents the truth of the Christian faith in a compelling, relevant and practical way. Their mission is to take the questions, issued struggles, and disagreements that exist within the Christian faith and shine the truth of God's Word on them. Topics range from Holy Spirit, Church, End Times, Angels and Demons, Christian Life, Theology, Humanity, Creation, Religion, Worldview, Prayer, Christianity, Marriage, Relationships, Family, False Beliefs, Life Decisions, Holidays, People in the Bible, Topical Truth and much more! Click Here for Bible Topics, Questions and Answers! THOSE WITH EARS, LET THEM HEAR! The signs are already here! 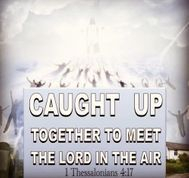 Nothing specifically must happen before the being "caught up" takes place! This can happen AT ANY MOMENT, in the twinkling of an eye!......Stop looking for signs. Rather, stand ready for the sounding of the Trumpet!!! !.......Yes, it's that time of season!!! STAND READY, BRETHREN! It's time to examine ourselves. Are we really in the faith? Playing games? Is it worth it? Only a handful will be taken! That "One Day" could be today! Where do you stand, Spiritually? Dead or Alive? Dead in your sins or Alive in Christ? If only people would realize how short time REALLY is!!! Stubborn World! Woe unto those who reject Christ, Son of God! 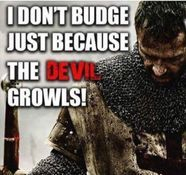 I 100% understand the struggle, the loses, the weight of carrying my own cross. But I also understand and TRUST in the POWER of God, which strengthens me, and in the eternal GAINS of following His Son, Jesus Christ, my Lord! Eternal servant of the TRUE LIVING GOD! Because we are in Christ, we do not have to fear the Judgment Day. We are told to be confident about judgment, not because of our own merit, but because we are covered by Christ's merit. He loves us, and His love drives away fear (1 John 4:17-18). 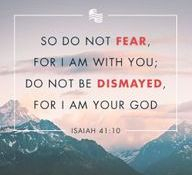 If, however, you do not know the Lord, you do have reason to fear. Nothing is more fearful than to face a perfect God who knows you perfectly and knows you have fallen short of perfection (Romans 3:20, 23). Jesus did not come to judge us, but to save us. However, those who reject His offer of salvation will face the Judge at the end of days without Christ, and that is truly something to fear (John 3:17-18). Our courage comes from being sure of the hope that lies ahead and from the POWERFUL GOD we serve. What can tiny, mere man do to us? They are men who trust in their VERY, VERY, VERY limited knowledge and "power". Can they touch our soul? Fear is lost when the HOLY SPIRIT takes over! BELIEVE that we are Not of this World. We are Children of God, sealed with the GUARANTEE of our inheritance! Sealed with POWER! Do you believe? Or did you believe in vain?......I SAY BELIEVE!!!!!!! !